Home News	HP Envy Note 8: Windows 10 tablet with stylus on the way! 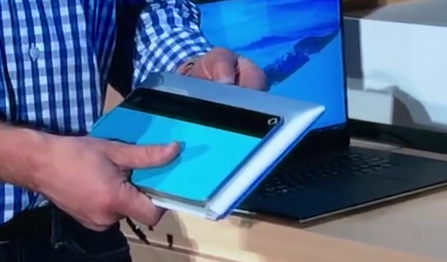 During its Computex hardware keynote, Microsoft briefly showed off what they called a “revolutionary note-taking tablet” from HP. Since then we haven’t heard anything about the device – even though Microsoft held another keynote about Windows 10 devices at IFA. Now we might know a little bit more about the it – although it’s also possible that we’re looking at another Windows 10 tablet from HP. Actually it’s pretty certain that those specs are true since the device was already listed here (Google cached). The included keyboard measures 10″ and therefore is bigger than the actually tablet part. In my opinion this sounds a lot like the device Microsoft showcased at Computex – although Parker mentioned a 9 inch screen. So we’ll have to see if the Envy Note 8 really is the “revolutionary note-taking” tablet, but I think the included keyboard and the stylus could make the tablet to a very interesting device.